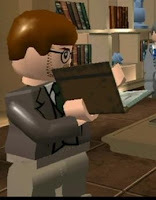 Not all that long ago I was hooked by a game that allowed me to play as a character who liked books. Now I find myself deep into LEGO Indy, in which archaeologist characters can get by certain puzzles by decrypting hieroglyphs. They carry books around. I… I just can’t stop. This entry was posted in books in games on August 27, 2008 by gala5931.